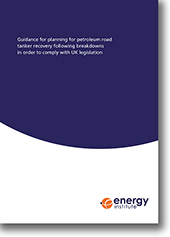 This guidance was commissioned by the Road Tanker Panel to help align understanding between relevant parties involved in petroleum road tanker recovery following a mechanical or vehicle system failure causing a breakdown. This publication provides recommendations for 'best practice' recovery, clarification on the relevant legislation and specific actions required by petroleum tanker operators and others to comply with this legislation. The intent and purpose of this publication is to highlight to petroleum tanker operators and others involved in the operation of these vehicles the legal obligations and constraints applying to themselves and other parties involved with the tanker recovery process. The other parties involved include - but are not limited to - the recovery vehicle operators and those in charge of loading terminals when a breakdown has occurred on their premises. It should be noted that legal obligations may extend beyond those directly responsible for compliance with the regulations to those who may be considered to have had a role in causing or permitting a breach of the regulations in the event that an offence is considered to have been committed. The identification of the actions required by petroleum tanker operators and others to comply with relevant legislation when a tanker has been rendered immobile or un-roadworthy as a result of a mechanical or vehicle system failure, whether on the public highway or on privately owned premises, and its recovery is being considered. The provision of recommendations for 'best practice' tanker recovery.